Radon gas is a hazardous thing to have around the house. It hangs around a short time before shooting out alpha particles. With a cloud chamber, scientists show us exactly what that decay process looks like, and it's stunning. 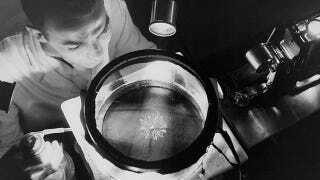 A cloud chamber is not a difficult thing to set up. With a little alcohol, a glass tank, and some dry ice, you could probably create one in your house. If you're not handy, you'll see a cloud chamber in nearly every science museum — it consists of a chamber full of alcohol vapor held just at the edge before it condenses. A disturbance causes the gas to condense and leaves a trail of vapor. In most cloud chambers, the things causing the disturbance are the famously misnamed "cosmic rays" — protons that have been thrown across the universe — which supply the regular entertainment. Sometimes museums amp up the thrills by releasing radioactive elements into the chamber, which cause beautiful, elaborate showers of droplets to spread across it. In conclusion, radiation can be awesome. If this isn't enough evidence for you, click here for an hour-long clip of uranium in a cloud chamber.